Are You Paying For "Unlimited" Data Too? I know I'm not alone when I talk about that gut wrenching feeling of realizing that your cell phone is a vegetable due to water damage. My wife and I recently went on our honeymoon in the Bahamas where my iPhone 5s took an unexpected dip in the swimming pool and has been on life support (in a bag of rice) ever since. In this day and age, it's almost impossible for Americans to go without the use of a cell phone for any extended period of time. I get the urge to check my email, Twitter, Facebook, and Instagram what seems like every 30 seconds. In fact, Millennials check their cell phone 43 times a day according to this Entrepreneur.com article, and I'm sure I am on the high side of that statistic. When I got back from my vacation last week, my first priority was to remedy my cell phone situation. Before I went out and picked up a new phone I had an important decision to make. My wife is a Sprint customer and has been for her entire adult life. I'm an AT&T customer, and I have been using their service for over 10 years. 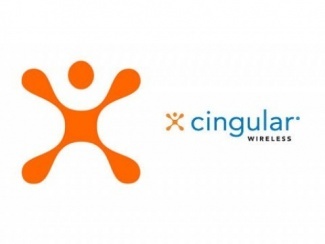 I got my first cell phone in Jr. High when Cingular Wireless was still a thing. I honestly wasn't quite sure if I should re-sign with AT&T or go in a different direction with Sprint or another carrier. Like a lot of people I'm on a grandfathered data plan that is still affordable compared to what many major cell phone providers offer now. I've been grasping on to my unlimited plan like Gollum ever since AT&T moved away from it back in 2011. After looking at my options for a day or two, I decided to stay with AT&T instead of switching over to my wife's service provider. What can I say? Maybe I am brand loyal to a fault. I had a phone again, and I had still managed to stay on my plan with unlimited data for a little bit longer. I figured it would be easier to just stay put with the same company and avoid the inherent hassles of switching over to another carriers. 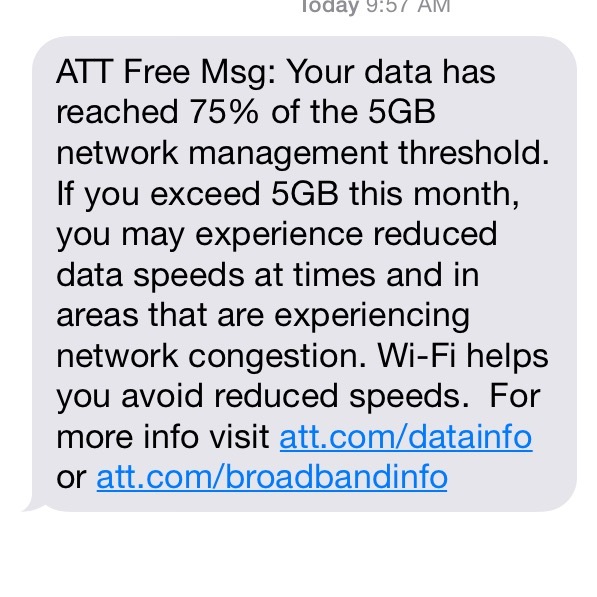 I recently renewed a 2 year contract with AT&T and now, a week later, I received this data throttling text. 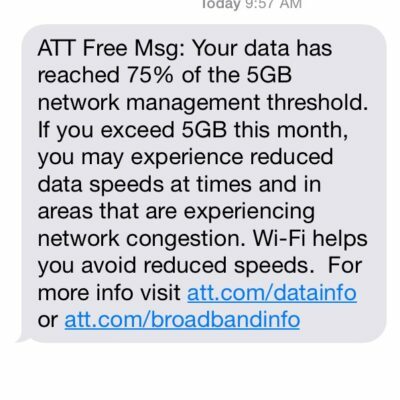 Unlimited data is a huge reason I've stayed with AT&T so long, but 5GB is clearly a limit. This will be my last contract with AT&T after being with them for over 10 years. You don't reward customer loyalty with poor service and poor product quality. This might seem a bit drastic, but I run much of my online business through my cell phone. I HAVE to monitor my twitter account and check blog comments in order to grow my brand. Being able to access my emails quickly is a necessity. Basically, slow internet and download speeds are simply unacceptable for someone like me. I also can't sit around at the office just to avoid my data service all the time! If this is going to be my cell phone future, I want nothing to do with it. Data throttling has recently become a big talking point in the media and among cell phone service customers since AT&T was hit with a monster 100 million dollar fine for misleading customers about unlimited data plans. Customers are getting fed up with the practice of providing “unlimited” service with a catch, and now I'm starting to see why. I paid for a service, and I want the company that I am paying to be straight-up with me about what I am getting. AT&T cites that they throttle their high data users in an attempt to cut back on tower congestion. The truth may really be that my grandfathered unlimited data plan makes me a less valuable customer than someone who pays for a tiered data plan. Even thought I am paying for unlimited data, it's pretty clear that the company that I've been loyal to for years wants to convince me to switch into a more cost effective plan for them. Fortunately, there are other options out there for people who are unhappy with their data services from their carrier. 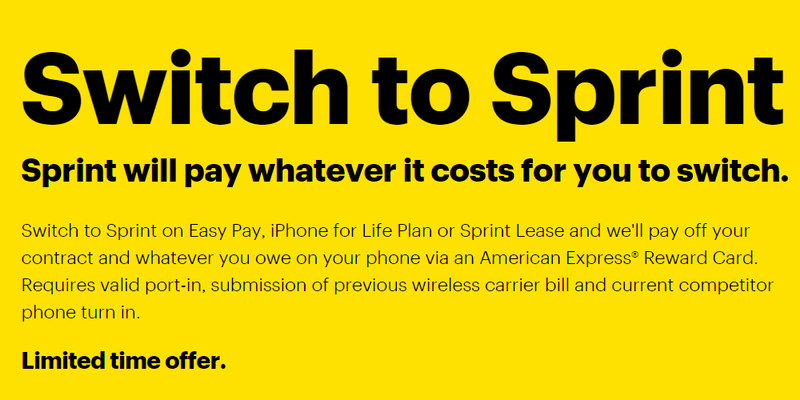 For example, Sprint has offered in the past to pay cancellation fees to convince consumers to try out their service instead. 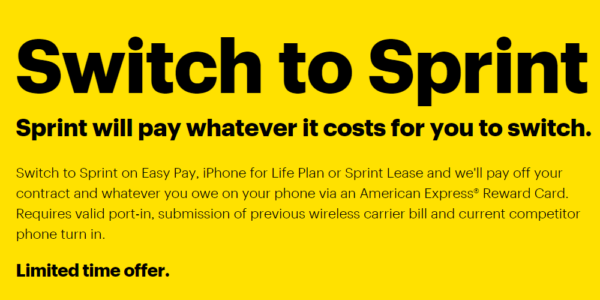 It might actually make my financial situation more simple considering that my wife is already with Sprint and happy with their service. Would it really be that great to switch to another big company that might do the same thing to me eventually? I'm not sure, but after my current contract expires I think I'll be willing to find out. Making this kind of change is always inconvenient, but I would rather know what I'm getting from my monthly payments rather than constantly worry about going over my data limit on an “unlimited” plan. Other cell phone consumers are finding KILLER ways to avoid the big name companies all together. For example, Vic with Dadischeap.com is using a prepaid cellular plan to save over $100 a month on his cell phone bill. My man J Money with budgetsaresexy.com is also saving a ton every month by going with Republic Wireless! If you are tired of dealing with the big companies like I am, there are definitely other options out there to consider. What do you think? Has data-throttling had an effect on you yet? If so, tell me about it in the comment section below. (We can vent together). Also, if you are finding ways to cut down on your cellular costs, share your tips! If unlimited high-speed data is a must-have, T-Mobile and Sprint are your options. Smaller carriers are definitely worth considering since they use the same networks as the big name carriers and can potentially save you money, but none offer unlimited high-speed data. Thanks for the heads up! I do go through a lot of data…have you ever used Sprint before? We’ve been on the prepaid path for almost 2 years now. We now pay $35 with Cricket for one line. It’s limited data though of 2.5 GB a month. It does it for us since we have hi speed internet service at home. Loving the prepaid route and not thinking of going back to a contract. The pre-paid strategy is pretty interesting. I’m definitely starting to see more people go in that direction. I guess I would just have to use Wi-Fi more often like AT&T wants me to use. Did you know you cannot set up a hot spot on your phone with ATT unlimited plan? I tried today and they told me I have to change to a different plan or get one more line with limited data on it. That doesn’t surprise me at all. I ended up switching to Sprint and got on my wife’s plan.